A little 8-bit of what you fancy? There's certainly a market for soft synths that enable you to create 8-bit/chiptune-style sounds, and the latest to go on it is AudioThing's miniBit. Said to emulate the sound of '80s games consoles and computers, it features a main oscillator with 12 waveforms paired to a sub oscillator (a square wave pitched one octave below). You can expect aliasing from the waveforms, and sounds can be roughened up further using the built-in bitcrusher. 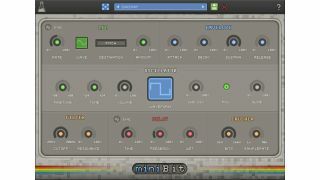 miniBit is available in 32/64-bit VST/AU/AAX formats and is currently being sold for €16 on the AudioThing website (the regular price is €20).